Guess what? This blog was born 3 years ago today! How many calories were consumed? Why has my photography only marginally improved? In any event, I can’t think of a better way to celebrate than with the Daring Bakers; today’s our posting date! 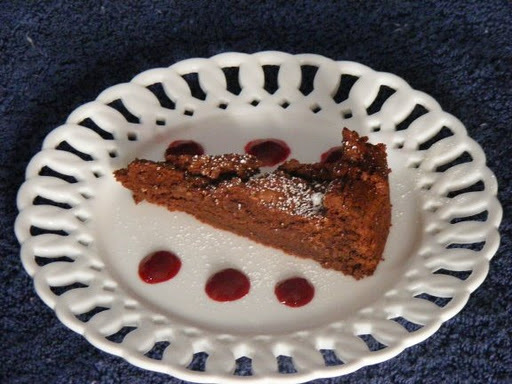 So to accompany my cake, I made a simple blackberry coulis (adapted from this recipe). 2) I used a 9-inch, round springform pan. And the result? A-MAZ-ING. It’s like eating a fantastic chocolate truffle — velvety, rich, decadent, fudgy — and the coulis paired beautifully. So thank you Wendy & Dharm for a fantastic challenge! This may be my favorite DB challenge thus far! 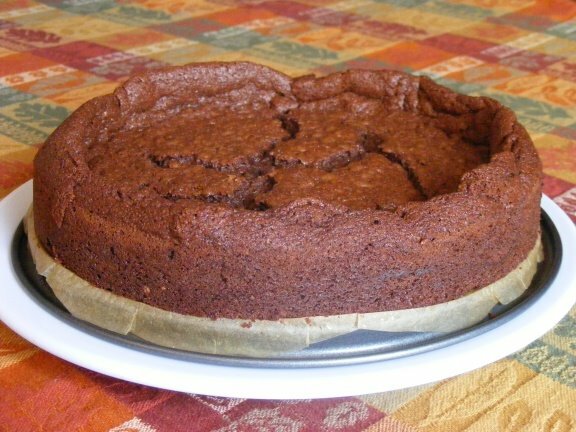 – Use your favorite chocolate – the finished cake will taste exactly like the chocolate you use. Be creative with your chocolate, if you like a sweeter cake use milk chocolate or a combination of the semisweet and milk chocolate. If you like bittersweet chocolate use that and add sweetness by mixing the semi sweet with bittersweet. If you are daring, try white chocolate. A higher cocoa percentage increases the bitterness of the chocolate. -Equipment – it is optional to use a heart shaped pan. For a real Valentino, bake it in a heart shaped pan or cut it out into a heart shape. You may use any shape pan that gives you an area of 50” – 6×8 or 7×7. An 8” spring form pan works with great results as do smaller pans or ramekins.